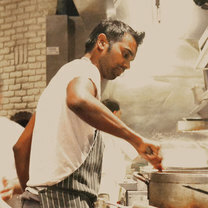 Mogan Anthony is the chef at Village Social and Locali Pizza Bar & Kitchen. His talent and passion for food can be traced back to his roots. Born and raised in Malaysia and having grown up in a Southern Indian family, he was mesmerized by the flavors and uses of the indigenous herbs and spices of his ancestors. "#purdysfarmerandthefish “local lettuce “ with anchovy vinaigrette @villagesocialkb"